Not long has passed since the last release, I know, however there were a number of little tweaks that needed to be disseminated to the public before too many people downloaded the old one. 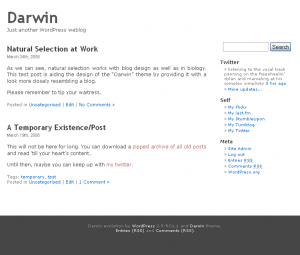 But anyway, the latest Darwin Theme is available now to download directly from WordPress Extend. Vote high stars for it if you like it. I’m currently trying to work out how to upload the source to Google Code so that others can come in on the development. This will happen in due time. 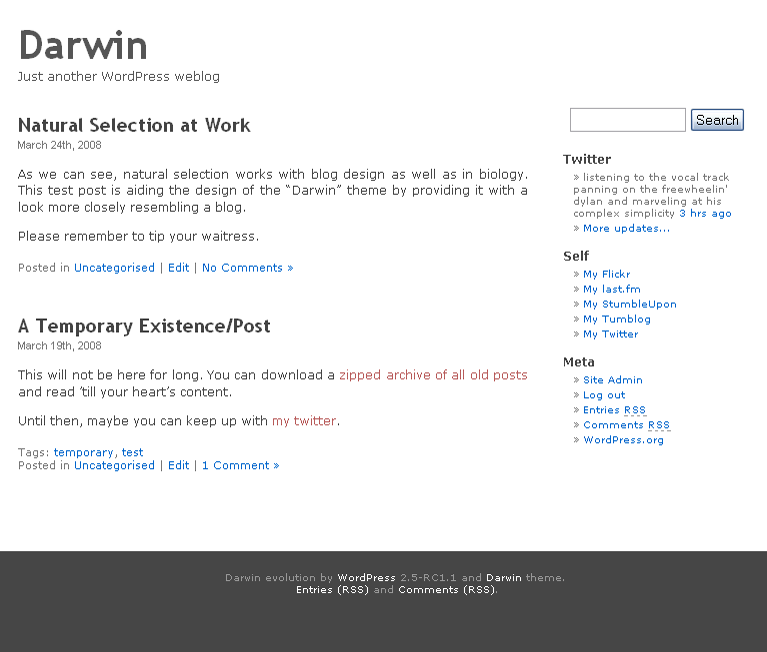 It has been a while between drinks, but here is the next revision of the Darwin Theme for WordPress. The evolution continues. The WordPress website has opened up its new themes section, so the new version should be available there once it is approved. To install, simply unzip the file and upload the folder to your WordPress themes directory. For a preview of the theme, just browse around this site (note: you may notice some differences being worked on for the next version). Made the title lighter and closer to the top. Took away the grey footer that was breaking the page sometimes. Replaced it with a groovy dotted line and changed the text colours around a bit. Changed header 3 size in archive and category page to match the normal posts because it looked strange. Changed the browser title bar display to show the page name first and then the blog name on single posts and archive pages. Changed attribution in the footer to link to the Darwin theme category. Made the <body> background colour white as it showed up during loading sometimes. Moved the <?php wp_footer(); ?> inside the footer div so that the little smiley face they use with wp-stats wouldn’t break the page layout. Cleaned up css a little from the mess that was the Kubrick css. Enjoy! Subversion repository should be coming soon so that you can add your own code to the theme and stay up to date with nightly builds. WordPress now comes with Gravatar support built in. So head on over, sign up, and upload your pic and use your avatar associated with your email address on loads of different websites around the web. Anyway, it’s late and I have no idea why I’m blogging this. Till next time. After a few days use and rigorous testing down in the lab and out in the wild blue yonder of the interwebs, this new species of WordPress theme we call “Darwin” has undergone the first tiny changes in its evolutionary and ever-marching journey towards a more perfect suitability to its environment. This post also serves as an excuse to use the Abduction! Firefox plugin, which allows full page exports straight from your browser. Install as per usual, as per the last Darwin post. 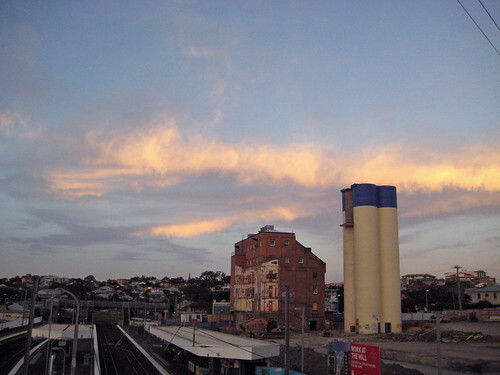 And as before, feel free to use and modify at will, with or without credit under the GPL. Shout back any favourable modifications you may stumble upon. Taking a break from the Grant McLennan Memorial Fellowship application that is slowly coming together, in between intended gatherings of The Strange Attractors, the occasional wanderings online, and Cieon, wonderful house mate coming home and persuading me into watching the Liv Tyler film Heavy, I stay on course, this ship just set for sail, across the wide Atlantic. This blog, now syndicating through FeedBurner and newly launched, is on the watchtower lookout for subscribers, subscribers to the blog feed. As we are utilising the latest trunk of WordPress, the bleeding edges of 2.5 RC2, of course certain plugins such as FeedSmith seem not to work. So in this post, along with testing the default display of code in a post, we will see quite an inelegant, and rather simple, hacky way of making sure all your WordPress feed references redirect to your blog’s FeedBurner feed. Update: ok, so it turns out that FeedSmith was working all along. I was just misjudging its functionality. Seems it redirects after clickthroughs to the feed and doesn’t actually physically change the link. I’ll keep this here for reference anyway. Just one simple edit in the general-template.php seemed to do the trick. Should be self-evident from the following diff output, monospaced and styled with the use of <code></code> tags. I may customise some css for for the next Darwin theme release. Seems quite good as it it though, clean and simple. Ok, so now there should be no subscriber left behind. Already FeedBurner is reporting 22 subscribers, which must be some kind of miscount or something as I only just put this in place a little while ago. I have no quarrels with bandwagon jumpers however. Is that rain I hear out my bedroom window? A welcome sign, though weeping heavens, if they persist in their sombre state, may present a challenge to my Thursday morning stroll, a new beginning to the working man’s blues, plaguing so many. Always on the lookout for an opportunity of creation to feed the masses, even if that means the photographing of destruction. I was searching for a very minimalistic theme, with a certain understated simple elegance, a theme that met with web standards, had widget support, and was easily customisable. Growing tiresome of wading through the sea of WordPress themes, looking for one that I could be truly happy with using, I decided it was high time I developed a theme of my own. So here it is, entitled “Darwin” after the grandfather of evolution theory, good old Charlie. Still in very early alpha stages, the Darwin theme is based very heavily on the default Kubrick theme that comes with WordPress. I originally tried to develop the theme from scratch, without much luck, and also began to develop it as a K2 style, but found that I was stifled by the limited flexibility. I’m releasing Darwin into the wild using the General Public Licence to encourage others to use and work on evolving the theme over time. The GPL basically states that you can use the code, change and modify it — you don’t even have to link back to me if you don’t want to, although it would be appreciated — as long as you keep all derived versions or modifications under the same licence. Through various tiny mutations, Darwin will adapt over time. Please let me know any genetic code changes you might make, so I can include them in the next release. I’m phocks at gmail.